Double Spiral Rope Stitch is a variation of the Spiral Rope stitch. 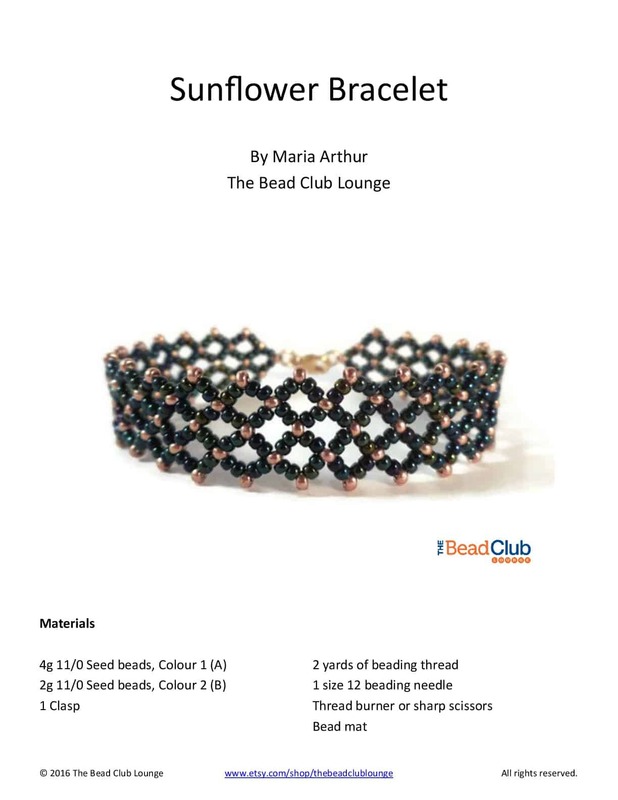 Learn how to create beaded bracelets and necklaces with this free beading pattern. Double Spiral stitch is a variation of the Spiral Rope stitch. Using this technique, you create rope jewelry that has two different loops of beads swirling around a central spine. If you have never attempted Spiral Rope stitch, you can find a tutorial here. It is however, not necessary to learn the basic stitch first before attempting the Double Spiral technique because it is a fairly simple stitch. Below you'll find a tutorial showing you a simple Double Spiral Rope bracelet using a combination of size 8 and 11 seed beads. This technique is highly adaptable and you can change up the pattern and add in any type of beads you like as accent beads. Leaving a 10-inch tail, string 4A. Step 2: To create Loop 1, string 7B. Go back through the 4A from the tail end. Step 3: To create Loop 2, string 7C. Pass through the 4A again from the tail end. Loops 1 and 2 should sit on opposite sides of the core A beads. Step 4: String 1A and let it slide down the thread to join the rest of the beadwork. Step 5: Ensure Loop 1 is on the right-hand side of the beadwork. String Loop 1 beads: 7B. Counting backwards from the 1A added in Step 4, go through the last 4A from the tail end. The new Loop 1 beads should sit on top of the previous Loop 1 beads. Step 6: Flip the beadwork so that Loop 2 is on the right-hand side. String Loop 2 beads: 7C. Pass through the last 4A from the tail end one more time. Repeat Steps 4-6 until you reach your desired length. Step 7: String 3A and one half of your clasp. Step 8: Go back through the last 1A strung. Step 9: String 2A and go through the last 4A. Weave back through the final Loop 2 and then reinforce the clasp. Weave the thread into the beadwork. Tie several half-hitch knots and remove the excess thread. Step 10: Repeat Steps 7-9 to attach the other half of your clasp. Enjoyed this Double Spiral Rope tutorial? Try these other spiral rope patterns. ​Clcik here to shop our selection of easy-to-follow PDF beading patterns!